Materials are expected to reveal the U.S. position on the mass execution 70 years ago. The U.S. is getting ready to unveil over one thousand documents pertaining to the so-called “Katyn case”, thereby revealing the details of U.S. diplomatic dealings with both the Soviet Union and Poland at the end of World War II and in the post-war period. On Sept. 10, the official website of the U.S. National Archives and Records Administration will open public access to all U.S. documents that regard the 1940 execution of Polish military officers in Katyn, Russia. Slawomir Dembsky, the Polish historian and director of Poland's Centre for Dialogue and Reconciliation, reported that the U.S. has compiled materials previously spread out across its government archives‒including U.S. intelligence offices. Many of these documents are known to have been part of the personal archives of U.S. Presidents Franklin D. Roosevelt, Harry S. Truman and Dwight D. Eisenhower. According to the Polish Foreign Ministry, some of the materials were even classified as secret by the CIA previously. They are expected to include German eyewitness photos of the discovery of the mass graves, documents on Poland's diplomatic attempts to draw the attention of the U.S. presidential administration to the crime, evidence of exactly when and how U.S. presidents were informed of the Katyn tragedy and the response they gave, as well as materials from the hearings of a special U.S. congressional committee set up in 1951. The congressional committee worked for nine months, analyzing the Nuremberg trial documents and U.S. army archives, questioning 81 witnesses, collecting around 130 items of material evidence and, finally, establishing that responsibility for the crime belonged to the Soviet Union and not Germany. Hardcopies of seven thousand materials put together by the U.S. congressional committee, including over two thousand deposition records, were given to Poland in 2003. What will come of the impending disclosure of these materials? Pundits in Poland do not expect it to yield any sensational discoveries. Historians are now waiting to learn only one thing: whether or not the archives will prove the theory that President Roosevelt knew about the massacre from the outset. It is also unknown what exactly Roosevelt knew at the time of the Yalta Conference in February 1945, when the allied nations discussed unofficial, albeit globally recognized, demarcation lines to be drawn between their respective spheres of influence. 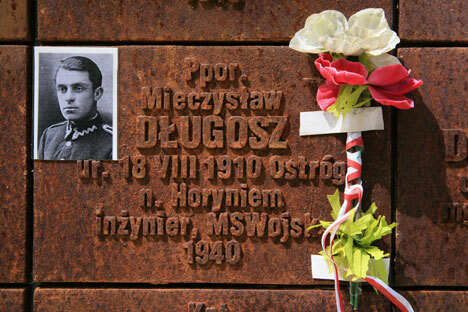 Slawomir Dembsky said: "We already know all the most important things about the Katyn massacre from Soviet sources. However, the U.S. materials may shed light on the so-called 'lies of Katyn'. It is certainly interesting to know whether Roosevelt was aware of the details of the shootings. It will show us whether or not his war-time statements about the Soviet Union's intentions toward Poland were sincere, whether or not he believed Stalin, and, generally, how special services and the U.S. administration used to exchange information at that time." The Katyn massacre was a mass execution of Polish nationals (mostly, prisoner-of-war officers of the Polish army) on Soviet territory during World War II. Its name derives from the village of Katyn, located some ten miles west of the Russian city of Smolensk. For several decades, Soviet leaders denied the Soviet Union's involvement in the shootings. However, a number of documents declassified in the 1990s, including a note by KGB head Alexander Shelepin, revealed that some 22 thousand Polish officers and officials were executed in a special NKVD (People's Commissariat for Internal Affairs) operation that was ordered by the Central Committee of the Soviet Communist Party on March 5, 1940. The “Katyn issue” has overshadowed Russian-Polish relations for many years, and, in 2010, Russia made electronic copies of documents concerning the executed Polish nationals public and handed materials from the criminal case on the shootings over to Poland. Russia has since continued to declassify materials related to the Katyn case brought by Russia's Chief Military Prosecutor's Office.